embellishments from The Curtsey Boutique. I'm pretty sure that the paper is Authentique ( gave this away as a gift) so I can't check. I used a spray mist to add color to the background . The date sticker was sprayed also, for color. I love the splattered look!!! Adorable! Just got some new misters to try! ooooo LOVE it. I'll have to check it out. Beautiful embellies. such an awesome layout.. love how you added the fabric.. great designing. Loving that fabric strip! Awesome layout!!! Great layout, Connie! 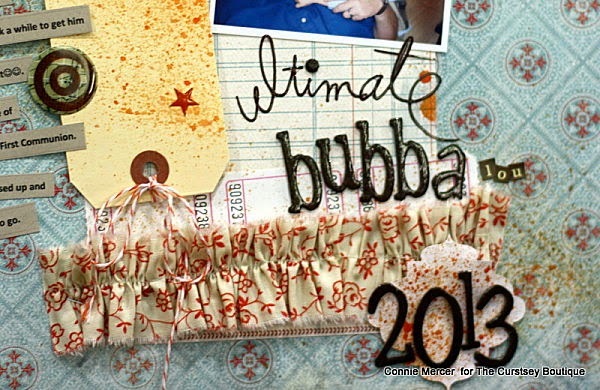 Love the pics, and that upside down tag is such a fun embellishment.